Are The White Cliffs of Dover the only National Trust property to have a song named after them? A song that played on a constant loop in my head for about 9 hours today? Or did The Wurzels ever do a number called (Let's All Go To) Horsey Windpump? If not, they should. 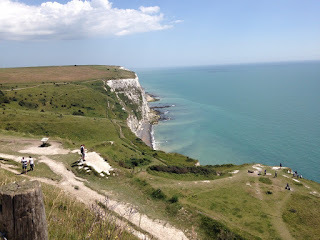 I was a bit dubious about going to visit the White Cliffs of Dover. Surely standing on a cliff doesn't give you the best view of it? I had already seen them through tear-filled eyes from the back of a P&O ferry in 1994, the year I was forced to leave the country to go and live in Germany for ten months. Anyone that knows me is now looking at their watch and saying "blimey, is that the time" because they've heard my tales of woe a thousand times, so I'll spare you. But! 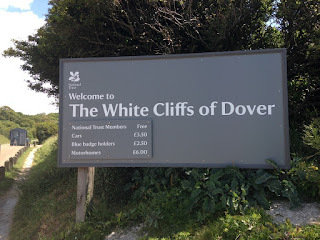 The White Cliffs of Dover are part of our DNA here in the UK, along with roast dinners and the theme tunes to Only Fools & Horses, so off we went. The first written record of the White Cliffs appeared in 55BC, when Julius Caesar arrived and saw hordes of angry natives standing on top of the cliffs waiting to welcome him with missiles. He carried on and landed at Deal instead. From then, Dover and the White Cliffs have played a role in lots of our historical moments. Henry V landed at Dover after Agincourt. Charles II landed at Dover when he returned from exile during the Restoration. The Black Death was a less welcome arrival - Dover suffered badly because of all those sailors arriving carrying disease. Dover also bore the brunt of bombardment during the Second World War - it was known as 'Hellfire Corner'. Tunnels and caves had been built into the cliffs throughout the centuries to support the defence of the realm and these were used extensively from 1939-1945 for anti-aircraft activity. The walk from the train station to the visitor centre involves a steep climb up some steps. 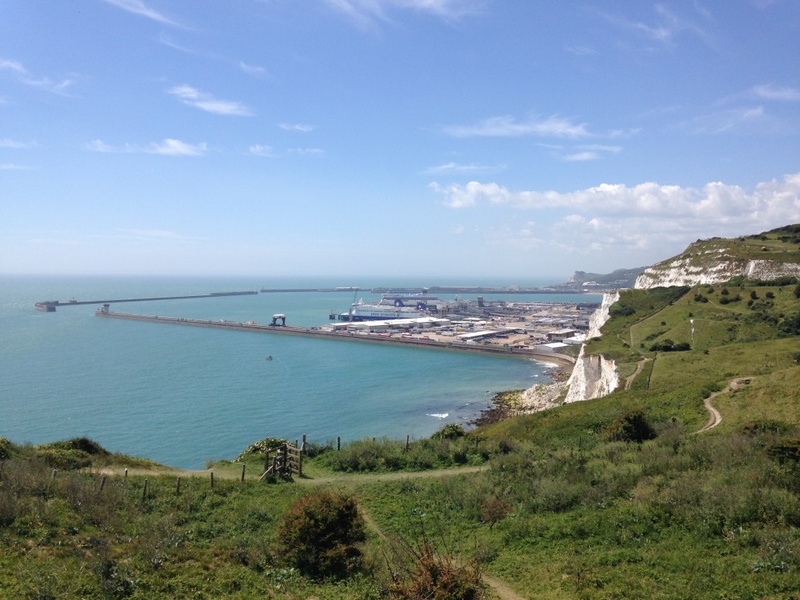 It's absolutely worth it though - the visitor centre itself is lovely, with a cafe offering plenty of outdoor seating so you can watch the ferries criss-crossing to and from Dover, while the enormous cargo ships manoeuvre their way east to west and back again. I had my concerns about the scones today, because if you can't get great scones at the gateway to Great Britain then we're all in trouble. 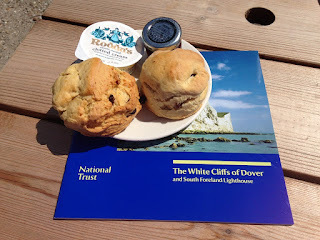 But I needn't have worried, because the scones at the White Cliffs of Dover were OUTSTANDING. They were fresh, light, fluffy and the portion was huge. Even the Scone Sidekick agreed that they were an undisputed 5 out of 5 and he is the Craig Revel-Horwood of this scone odyssey. If I started the day with Vera Lynn in my head, I ended it with Lou Reed singing Perfect Day. 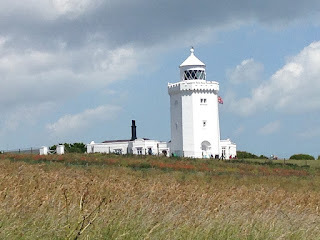 I honestly cannot think of a nicer way to spend a sunny Saturday than walking along the White Cliffs of Dover and visiting the fantastic South Foreland Lighthouse. Highly recommended. I always claim that I am above celebrity gossip. There's no Heat magazine for me, no Daily Mail website sidebar of shame keeping me informed on who faces marital ruin because of her cellulite. 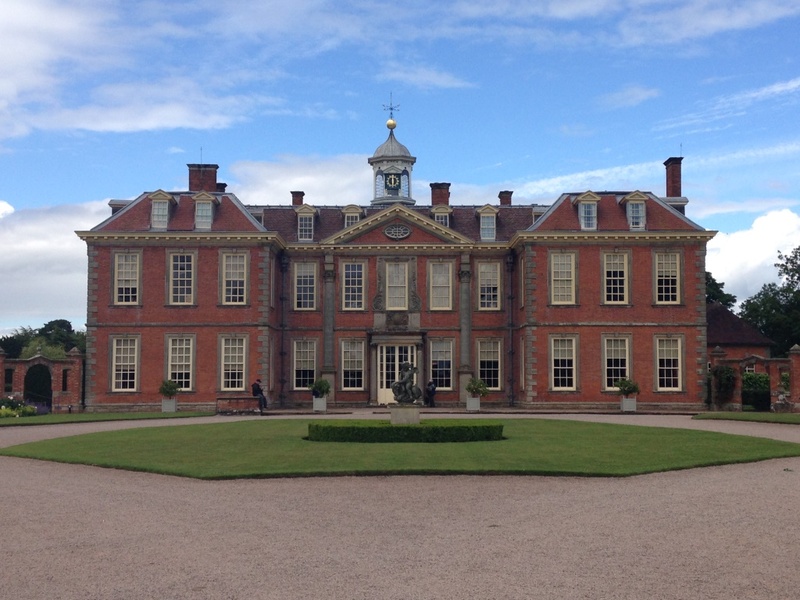 However, I will cheerfully admit that I love reading about National Trust properties like Hanbury Hall near Droitwich. Hanbury was passed down through generations of the Vernon family, who all look very sombre and had extremely officious jobs and made incredibly important improvements to the house and grounds that tell us a huge amount about 18th century horticulture, until Emma Vernon ELOPED WITH A CURATE, forcing HER HUSBAND to rename himself John Jones and live on a farm! That whooshing sound is Hanbury Hall flying up the scone blogger's destination list. I know. However, when Henry took her to say her final goodbyes to her departing curate, she waited until Henry's back was turned and then escaped out of a window so she could run off to Portugal with Sneyd! He fell in love with Sarah, a 16 year-old farmer's daughter, and married her - bigamously! Emma returned to the Hanbury area, marrying a local lawyer - when Henry died, she moved back into Hanbury Hall. There was no portrait of Emma in the house. If you're a fellow scandal fan, you should read about Ickworth - the woman who befriended the Duchess of Devonshire (Keira Knightley) and then stole her husband (Ralph Fiennes) was born at Ickworth and they have a picture of her looking all very innocent in a big hat. But nothing of Emma at Hanbury. Maybe her husband cut them all up or scribbled devil horns on them. Hanbury Hall itself is lovely. 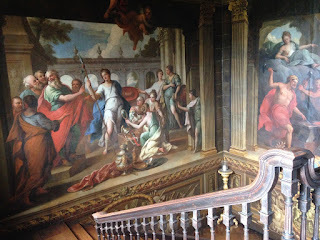 The highlight of the interior is the Great Staircase, which was painted by Sir James Thornhill for Thomas Vernon. It was good practice for Sir James, who went on to paint the cupola of St Paul's Cathedral. The gardens are also lovely. There's a bowling green (the first time I've seen one of those) and a mushroom house (ditto). Anyway. I wasn't feeling terribly positive about the scone situation at Hanbury today, mainly because my last scone mission had been a disaster. I was taught a very harsh lesson: there IS something worse than no scone and that's a stale scone. 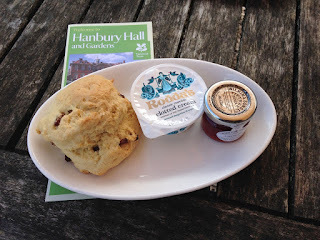 But I needn't have worried because the scone at Hanbury Hall was very good. I don't think it was fresh but it wasn't far off. I will end by continuing my series of Amazing Factoids That Get The Briefest of Mentions in National Trust Guidebooks. Today's nugget comes not from Hanbury Hall itself but from the local church. According to the guidebook, the bells of St Mary the Virgin can often be heard on Radio 4 as the bells of St Stephen's in Ambridge! I've never listened to a single episode of The Archers but I know a good factoid when I see one! Celebrity bells! Amazing! I spent the first eighteen years of my life in Northamptonshire where there was a church called the St Nicholas Owen. It says a lot about me that I never once wondered who St Nicholas Owen was. But then in my defence there were an AWFUL lot of saints and I didn't have access to Wikipedia at the time. Anyway, I now know that Nicholas Owen was a courageous little man who built priest holes in Catholic houses during the time of Elizabeth I and James I. Baddesley Clinton, a lovely moated manor house in Warwickshire, was one of those houses. In fact, Nick built priest holes all over the place. He was arrested in 1594 and was tortured, but refused to reveal any details about his work. In 1606 he was arrested again and taken to the Tower of London, where he was tortured again on the rack. It killed him and he was canonised in 1970. 1. John Brome - murdered! There has been a manor house at Baddesley since before the Norman Conquest. In 1438, it was bought by a lawyer called John Brome. He was murdered in a church doorway in London by a man called John Herthill during a quarrel over property. 2. Nicholas Brome - murderer! Twice! John's son, Nicholas, avenged his dad and murdered John Herthill in 1471. He then killed AGAIN - one day he found the local priest flirting with Mrs Brome, so he murdered him. To make up for his crimes, Nicholas built the tower at the nearby church. 3. Henry Ferrers - friend of Catholics! The Ferrers family took ownership of Baddesley in 1517, through the marriage of Sir Edward Ferrers to Constance Brome. In the 1560s, their grandson, Henry, inherited. He was known as The Antiquary because of his love of history, but what is most interesting about him is that he leased Baddesley out to the Vaux sisters, two fervent Catholics who used the place to harbour Jesuit priests. This was a treasonable offence at the time and the punishment for treason was to be hung, drawn and quartered, which was not very pleasant. Not only that, Henry also leased a place in London to Thomas Percy, one of the Gunpowder crew, who actually stored the gang's gunpowder there! Henry must have had friends in high places to have got away with this, but he did and he died aged 84. 4. Marmion, Rebecca, Georgiana and Edward - the Quartet! Marmion Ferrers inherited in the 1830s but he and his wife Rebecca were not well off at all. In 1869, Rebecca's aunt Georgiana and her husband, Edward Dering, came to live at Baddesley and it was their money that was used to keep the place going. The four became known as 'the Quartet', until Georgiana and then Marmion died, and then Rebecca married Edward. When I heard about "the legend of Greycat", I was expecting him to have solved a murder case, or to have saved the lives of 15 priests. In fact, his claim to fame involved him accompanying Mr Ferrers-Walker on his walks. And he lived to be 21. Which is admittedly quite impressive. 1. I'm one of those people that never complains in restaurants. I have sat there on numerous occasions boring my companion to death about the substandard food and yet when the waiter came to say "everything ok?" I've said "YES! FANTASTIC! THANK YOU!" Maybe it's because I am British. Or maybe it's because I am an idiot. 2. 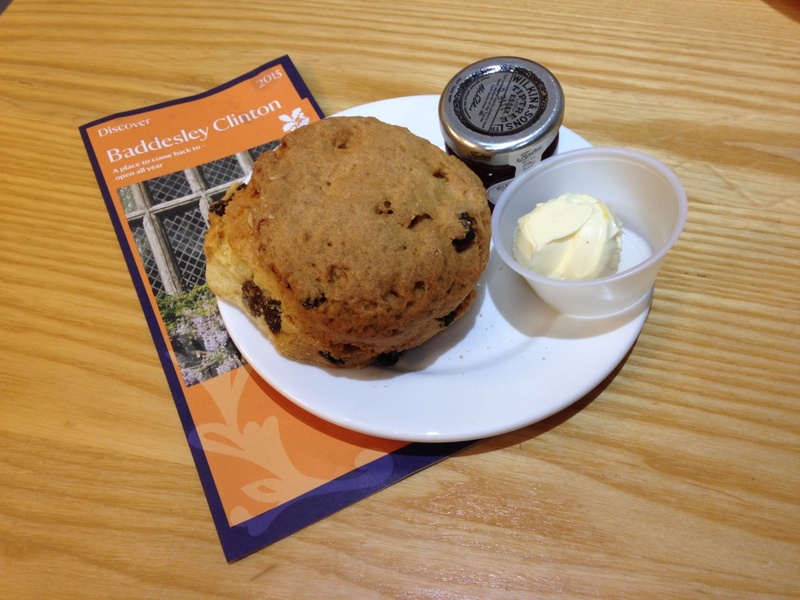 This was my 82nd National Trust scone and I've never even thought of rejecting one before now. 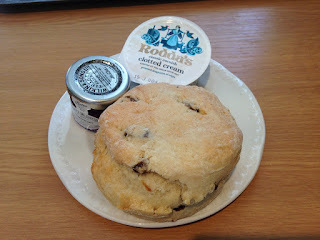 So when I say that I couldn't eat the scone because it was stale, I hope you know that I had very good reason and I'm not just trying to be controversial. 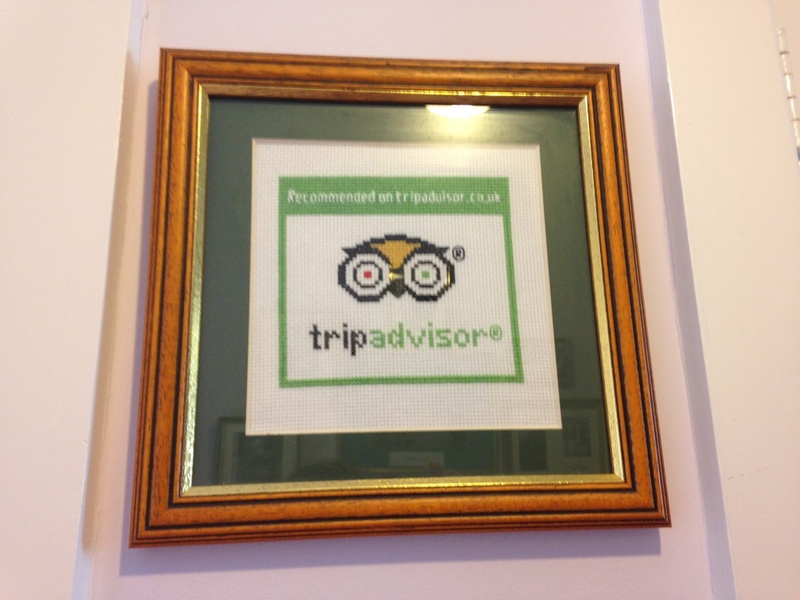 The staff, however, were LOVELY about it and hastily got some replacements. They'd been microwaved, which makes scones soft and squidgy, but they tasted a lot better. I am going to finish by telling you how much it troubles me that it took 364 years for Nicholas Owen to be made a saint. 364 years! WHY? Surely a miraculous deed is a miraculous deed! 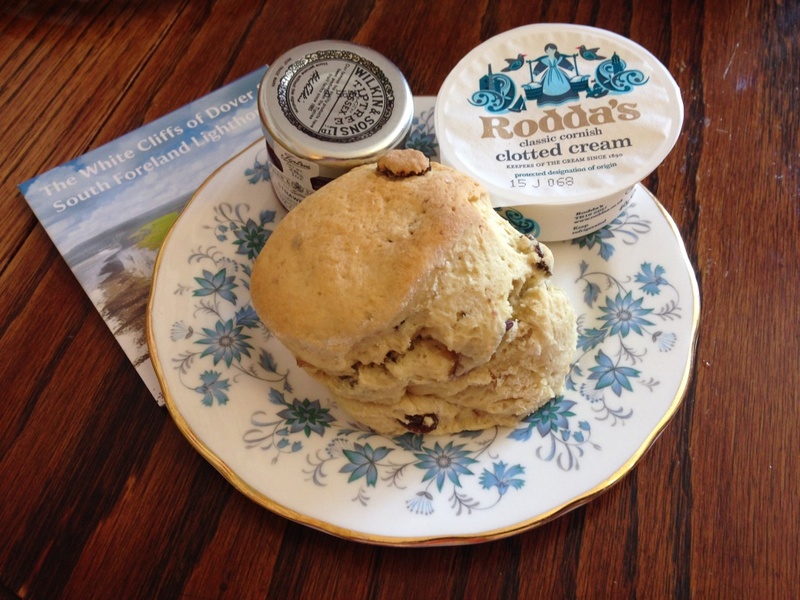 There is currently no patron saint of scones and I will be a shoe-in for the role once I have completed my National Trust scone odyssey. 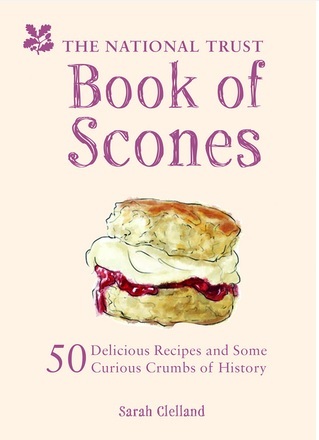 I've still got around 150 scones to go but clearly I should get my application in. One of the downsides of being the National Trust Scone Blogger is that eventually the day will come when I will be asked to become chairman of the National Trust*. And I will have to decline the offer because although I care passionately about scones, I am less clued up on other areas of importance to the preservation of the nation's heritage, such as what to do about death watch beetles. 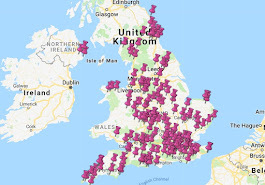 But there's one area of National Trust business that I absolutely avoid thinking about at all costs because it hurts my head and that is tenanted NT properties like Hatchlands Park in Surrey. 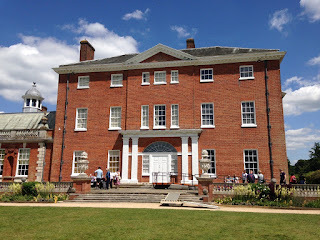 The house at Hatchlands is not open to the public on Saturdays, and only from 2pm to 5.30pm on Sundays, because of agreements with the tenants that live there. I'll be honest: this is really annoying. It's also not very conducive to a pleasant visitor experience - at 2pm it was like Westfield Shopping Centre on Boxing Day. I should have been a bit more sensible and waited 15 minutes for the initial rush to subside, but the woman on the gate had warned me that a coach party was arriving at 2.30pm. This was really nice of her, but she'd told everyone else the same thing so it was a bit of a scrum. I wasn't enjoying it much at all, until I got to the Music Room. There was a young girl in there playing the violin brilliantly without any music (I'm going to guess she was 13 but I'm absolutely terrible at ages - for all I know she was in her forties). It was beautiful - she was incredibly talented and the music showed off the acoustics of the room nicely. The guidebook sheds a bit of light onto why the tenants insist on such limited access; Hatchlands Park was left to the National Trust in 1945 without any contents. In 1985, the Trust approached Alec Cobbe and his family with a proposal for them to move in and make it a family home, bringing furniture and art and heritage expertise with them. The Cobbes have historic connections to Sir Anthony Browne and his wife Elizabeth, who were granted the estate in 1544. Hatchlands then passed through a number of families before coming back to the Cobbes, the most significant owner being Admiral and Mrs Boscawen who built the house as it stands today, with interiors designed by a young Robert Adam. Alec Cobbe collects keyboard instruments. In the Drawing Room is a pianoforte that belonged to Marie Antoinette, and there are other instruments either owned or played by Chopin, Mozart, Johann Christian Bach, Beethoven, Liszt, Elgar, and Mahler. The Cobbe art collection is also displayed throughout the house. It's a family home and the collection is private though, so no photographs are allowed. But onto the scones. 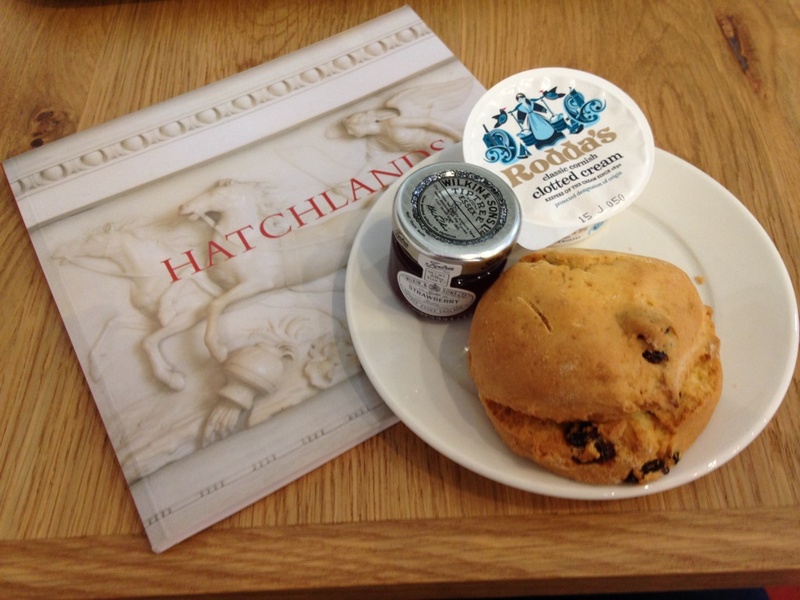 I'd heard that the scones weren't so great at Hatchlands, although they've had a new cafe installed since then. I'm not sure if they bake the scones on-site now (they didn't use to) but there were plenty of them and they were a nice size. It was a little bit on the dry side, but very tasty - I enjoyed it. So it's been an interesting weekend for the Scone Blogger - yesterday at Tatton Park, which is NT owned but run by Cheshire East Council, the result being that it's a bit more commercialised than most NT properties. And then today the other extreme; Hatchlands as a family home that only allows the public in for 3.5 hours at the weekend (it's also open at the same time on Tuesdays, Wednesdays, and Thursdays though - just to be clear on that). Anyway, I'm going to put 'tenanted properties and how they work' onto my list of Things To Ask Dame Helen Ghosh Over a Glass of Wine (Large). 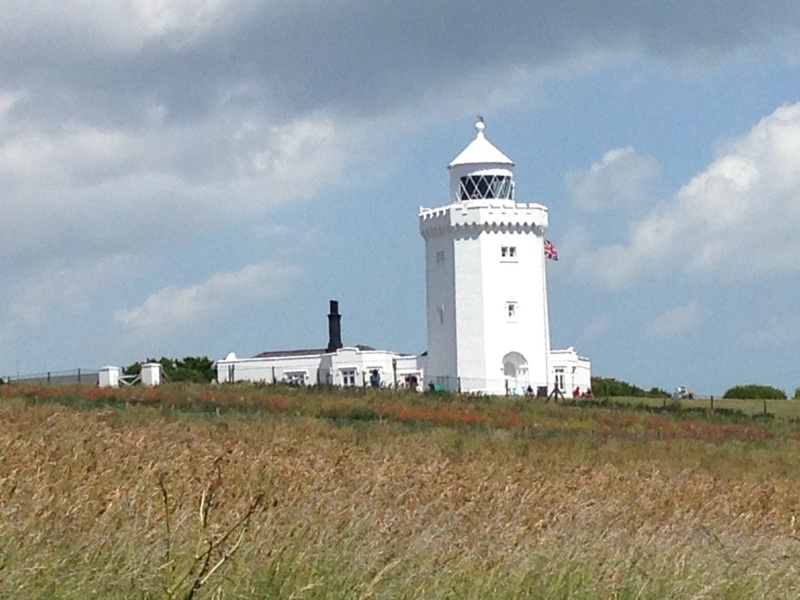 What would happen if the National Trust handed one of its properties over to be run by the local council? If you had asked me that question yesterday, I'd have said; "It would be neglected until it was utterly ruined. Either that or it would be over-commercialised until it was utterly ruined. I am hedging my bets here, but I am fairly confident on the utterly ruined thing." But, not for the first time, I would have been WRONG. Today I went to Tatton Park, which was left to the National Trust in 1958 but is run and financed by Cheshire East Council and neither of those things has happened. 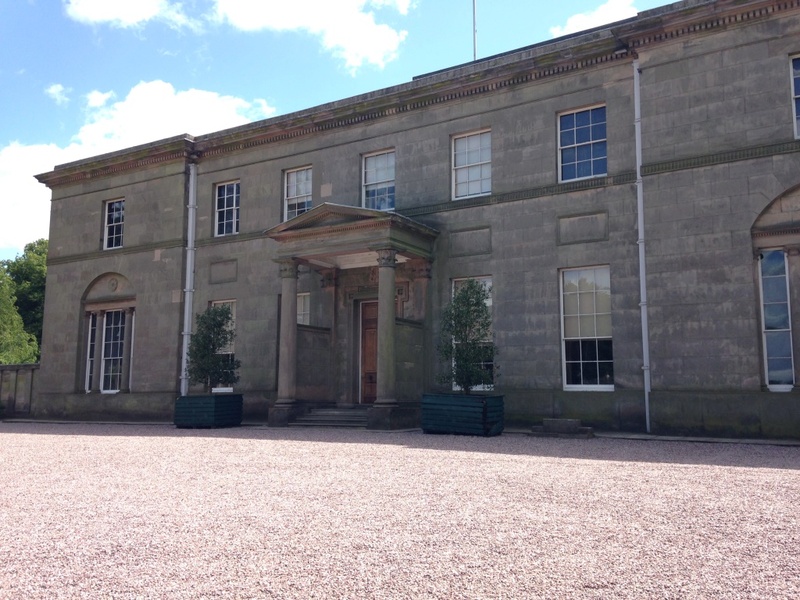 Don't get me wrong; Tatton Park feels more commercial than most other NT properties. A bit of pre-visit research showed that it hosts over 100 events every year. I got very excited when I read about "Fergie at the Farm" as I thought Sir Alex Ferguson had found himself a new career, but Fergie turned out to be a cartoon tractor. Other events range from the Moscow State Circus to "Pigs Galore". How can anyone resist an event called "Pigs Galore"? But after a few hours there, I can report that overall it felt very similar to other National Trust places (and NT members get in free of course). Something strange is happening. 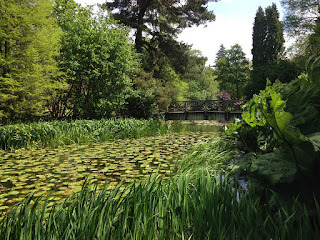 Either I am developing a very unlikely love of gardens, or I have coincidentally managed to visit the two loveliest gardens in Britain in the past seven days (last week I went to West Green House Gardens). Tatton Park Gardens are stunning. There's a really good map that directs you round the various elements - there's a beautiful Italian garden right outside the house, a kitchen garden, a rose garden, a Japanese garden, a pinetum...you name it and Tatton has it. Tatton Park was owned by the Egerton family from 1598 to 1958. It became their main residence in the 18th century when John Egerton decided to build a new house, which was finished in 1716. The house was then extended by various Egertons over the years. A lot of other estates have an up-and-down history, where one earl does loads of renovation work and then the next owner prefers to live somewhere else and leases it out to a farmer who lets his cows live there. But the Egertons all did something positive to the place - they seem to have remained financially solvent, which probably helped. The park around the mansion covers 2000 acres. It has been a deer park since 1290 and there are still red and fallow deer wandering about (probably not the same ones). Humphry Repton was involved in the landscaping of the park - he prepared a plan of recommendations in 1791, which included improving the water features. Today there are two nice lakes, which help make it a pleasant park to walk through. It was very busy with joggers, walkers, dogs, cyclists, people having picnics; it's clearly a big part of the local community. 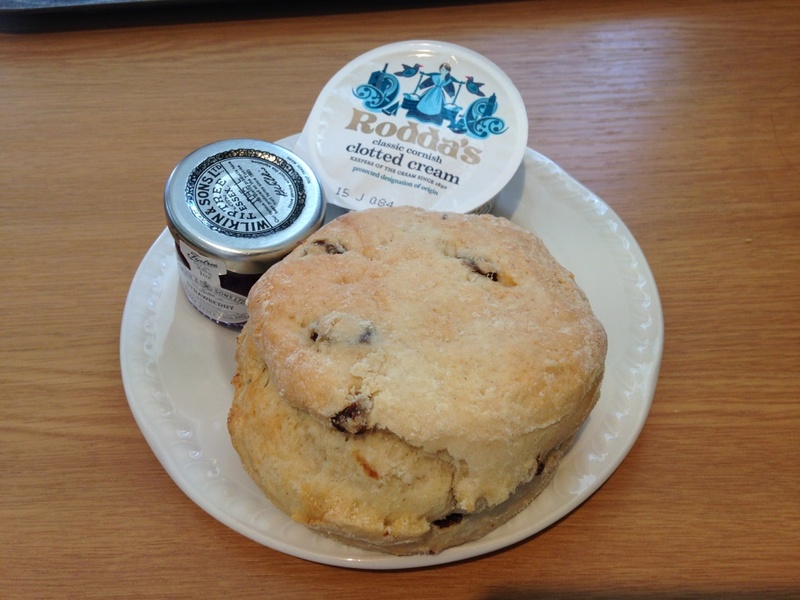 If Tatton Park is run by the council then Tatton Park scones are probably baked by the council, which means I probably shouldn't include them in this study. 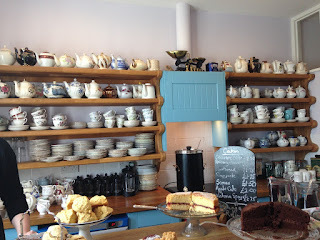 Margaret is undoubtedly very good at baking scones - mine was enormous and very tasty indeed. I am also happy to report that as I joined the queue, the woman in front of me looked at my tray and shouted across at her husband; "Dave, get me a scone?" My work never stops. 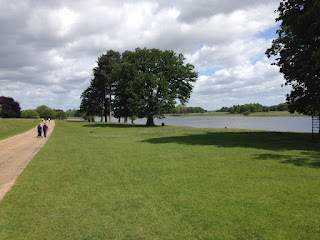 National Trust or not, I absolutely loved Tatton Park and I highly recommend it.